Every ten years every bishop in the Anglican Communion attends theLambeth Conferenceto share ideas and discuss church policy. The 1998 conference was held in England from 18 July until 9 August. THE LAMBETH CONFERENCE ENDED ON 9 AUGUST1998, but we'll keep this page online. You might be interested to know that during the Lambeth Conference we received more than 11,000 hits on our web server per day. A lot of you were stopping by! We're very pleased and grateful for your support and readership. It means more than we can say. News and Reports : press coverage of the conference. If you'd like to see just what Anglican Bishops have passed during the years, browse these pages put up by the Anglican Communion News Service. It may make you feel better about the church and politics. Or perhaps worse. A reflexion at Ship of Fools, by 'Sister Mary Diocletian, SPP (Sisters of Perpetual Persecution)', which has inspired a response by Faith McDonnell, and a further essay by Sister Mary Diocletian. More and more diocesan bishops are writing and distributing reports on the Lambeth Conference. As we learn about them we'll link them here, listed by diocese. For more on the Lambeth Daily and what it was--and its Adobe Acrobat format--see below under the category 'News and Reports: Web (official sources)'. One month after the end of the conference, the official texts of the conference resolutions have been placed on the web, though not all in one place. We have not yet found any changes from the unofficial version that we published on 21 August, though mechanized comparison is impossible. We do not know of a single URL that will locate all parts of the official texts. Link here to Section 1 , Section 2 , Section 3 , and Section 4 , then link here for the other material. If you need a subject index , or if you need it all in one place, you'll have to use our copy , which is of course unofficial. On August 13 the Most Rev. George Carey, Archbishop of Canterbury, wrote a letter with the intention of having it read aloud in every Anglican church in the world on Sunday, 28th September, 1998 (sic). You may read a copy of it here , or look at a photographic scan of the original ( page 1 and page 2 ). http://www.anglicancommunion.org The current official web site for the Anglican Communion Office in London. The conference apparently has an email address: lambeth98@lambeth98.org We don't know who's answering the mail, but it's an address. A personal domain for the ABC: http://www.archbishopofcanterbury.org , which points to the preexisting pages that most of you have probably seen. A set of official Lambeth Conference web pages sponsored by the Nippon Sei Ko Kai (The Anglican Church in Japan), only in Japanese. Even if you don't have a Kanji character set on your computer, you might like to have a look at the photos scattered throughout the pages. Official photos and candids as well on the Lambeth Conference site. Daily reports from St Cosmus and St Damian in Blean, Kent contain some very nice photos, quite quick loading as these things go. From Australia to the Arctic A virtual tour of our 70-million worldwide Anglican Communion (somewhat outdated, but useful as an overview, and hosted on an even older but still possibly official Anglican Communion Office website, http://www.quest.org.uk ). Bishop Basics, a whimsical collection of miscellaneous episcopal links assembled by the BishopCam group at the University of Kent at Canterbury . Canterbury Cathedral, an unofficial site, but very interesting. The general Lambeth Conference calendar on the Anglican Communion Office site is a quite skeletal outline of what's on. The Lambeth Conference 'Market Place' and Diary of Events If you're in the neighbourhood of Canterbury, you might want to stop in, have a look round the stalls, and stay for the evening events. August 4 would be our choice. Update on Market Place arrangements, from the Revd Bob McCloskey, coordinator. 'BishopCam' A light-hearted project by the Computer Science department at the University of Kent at Canterbury to provide some real-time video of the conference. Alas, the fixed camera is stationed in a window overlooking at crosswalk between two buildings, not perhaps the most ideal place for it to be pointed. We'd prefer the plenary hall. But now and then you can indeed espy a purple shirt. On the other hand, because the camera system is so automatic, the BishopCam Cabal have some time on their hands and are doing a smashing job of scouting Lambeth-related news stories. Have a look. The Anglican Communion News Service is the primary reporting group for Lambeth. Go here for ACNS news releases about Lambeth; at present, these contain text only, no photos. Anglicans Online have converted highlights of The Lambeth Daily News to web format for your viewing convenience. We don't promise to have the strength to keep up these conversions every day, but we'll give it our best shot. The index page shows the dates for which we have such files available. Links to key stories emerging from Lambeth or related to Lambeth Conference issues. (See our page on reading The Times if you've not tried to access a Times web page before.) In addition to the stories listed below, see the BishopCam collectionofnews for more. Simon Sarmiento's (Society of Archbishop Justus) report about Resolution III.2 , which was entitled 'Unity of the Anglican Communion' but which was more specifically about the position in the church of those who oppose the ordination of women to the priesthood and episcopate. The title on the archbishop's own website ( http://www.archbishopofcanterbury.org/speeches.htm ) is given as 'We Must Protect Our Young People' which is, oddly, not what the Times used. The House of Lords speeches delivered by the Bishop of Winchester and Lord Habgood, the retired Archbishop of York (both against lowering the age) and by the Bishop of Bath and Wells (in favour). Videotapes of Lambeth plenary sessions: Christ Church in Red Hook, New York is offering a full roster of unedited videotapes (NTSC or PAL format) of the sessions, taped by their rector, the Revd Fred Cartier. Their Lambeth web page carries a detailed listing of what's on each tape (generally one plenary session per tape). Each costs US $14.95, plus US $5 shipping and handling. In his email to Anglicans Online the rector notes: 'I was there for most of the conference (40 hours) and these are the only videos that will be available'. We've heard of no others. The Church Times, in its print edition but not online, reviewed the online coverage of the Lambeth Conference. We have transcribed that article here. Bishops Behaving Badly: a reflection at Ship of Fools, by 'Sister Mary Diocletian, SPP (Sisters of Perpetual Persecution)', which has inspired a response by Faith McDonnell, and a further essay by Sister Mary Diocletian. Is Reception Really Open? Mary Tanner reflects on living with difference from Lambeth 1988 to Lambeth 1998 . She was until recently Secretary of the Council for Christian Unity of the General Synod of the Church of England. This article first appeared in New Directions, August 1998. Anglicans Online have placed a copy of the Resolutions passed by the conference on the web; as of 29 August we believe our copy is still the only one available. We've provided you with a basic subject index as well. Martin L. Smith SSJE, superior of the Cambridge monastery of the Society of St John the Evangelist , delivered a talk on the Lambeth Conference during the Eucharist at the monastery on Tuesday, 25 August, 1998. The Rev. 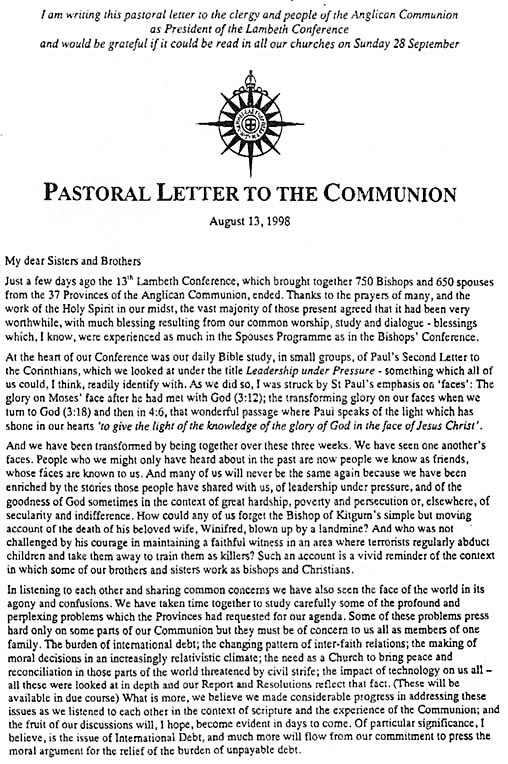 Dr. Stephen Noll, Professor of Biblical Studies at the Trinity Episcopal School for Ministry , wrote a letter published in the Letters section of the 28 August 1998 Church Times . 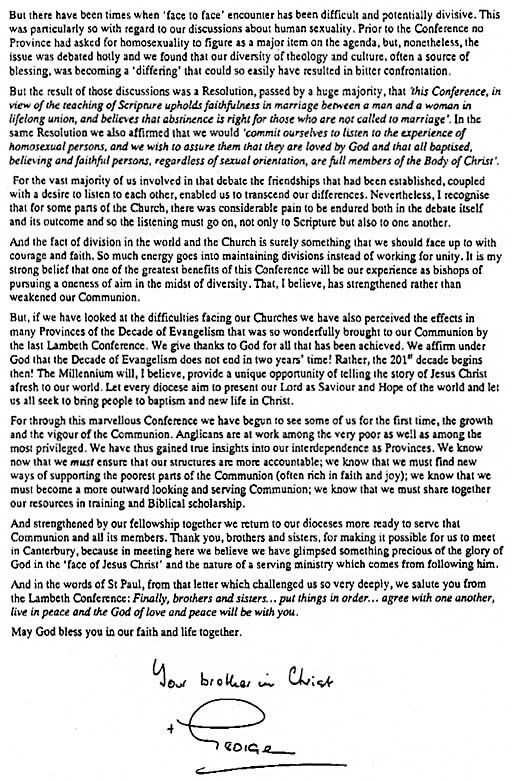 The Tablet published a letter on 21 August 1998 from Canon James Rosenthal in response to the Ruth Gledhill article "My Lambeth Hell". Since this letter appeared only in the print edition of The Tablet , we have transcribed a copy of that letter here at Anglicans Online, so that you may read it. Do read Ms. Gledhill's article first.
' My Lambeth Hell' , Ruth Gledhill, in The Tablet, 14 August 1998, but not on their web site. We have transcribed a local copy.. Don't miss Canon James Rosenthal's reply . Andrew Brown's pulls-no-punches look at the Lambeth Conference, The Telegraph, 18 July 1998. The Guardian (UK) considers the Lambeth Conference (19 July 1998) and Bishop Holloway's scheme to toss biodegradable mitres into the Thames. The Times (London) on 18 July features two lead stories on Lambeth in its news of Britain section. We explain in full how to read an article in the Times; it can be worth it, but it's a bit tedious. The folks looking after BishopCam are doing a fine job scouting Lambeth news stories on the Internet. Daily reports from St Cosmus and St Damian in Blean, Kent (just outside the city of Canterbury) The staff of this parish church are providing brief daily reports of the Lambeth Conference, with photos. We believe they were the first site on the Net to supply behind-the-scenes images two days before the official opening of Lambeth. Start at their home page and link to their Lambeth coverage from the left-side menu. Episcopalians United Lambeth reports by Doug Le Blanc. Reports from people connected with the various Prayer Book Societies round the world, hosted at the Prayer Book Society of Canada web site. Also links to Lambeth news stories and coverage of special events at the conference connected with the Prayer Book societies. Integrity has a Lambeth News section. A booklet of prayers for Lambeth, by Bishop Roger Herft, the Chaplain of the Lambeth Conference . A Lambeth Conference prayer, in the seven languages of Lambeth. (The prayer was composed by Janet Morley of Christian Aid.) The HTML code of this page is a bit scrabbled, and an image intrudes into some of the translations, affecting one's ability to read the various versions clearly. But it's worth trying to do so. Lundi-Lambeth prayers, composed by the Reverend June Maffin in preparation for the Lambeth Conference.